Whether paddling the mild waters of Baja California, adventuring along the rugged coast of Oregon, or drifting through glacial straits in Alaska, sea kayaking is arguably the most impactful way to explore the ocean’s surface. Camp at one of these locations along the West Coast of North America for a paradisal kayaking excursion. Located near San Diego, California, the La Jolla Sea Caves consist of seven naturally formed cliff grottos—White Lady, Little Sister, Shopping Cart, Sea Surprise, Arch Cave, Sunny Jim, and Clam’s Cave. As well as being a sanctuary for marine life and a snorkeling hot spot, the caves boast an out-of-the-ordinary history. Legend has it that they were once used by pirates to smuggle slaves and treasure, then used again in the 1920s to store illegal liquor stashes. The Sunny Jim cave can be accessed by foot through a local gift shop. 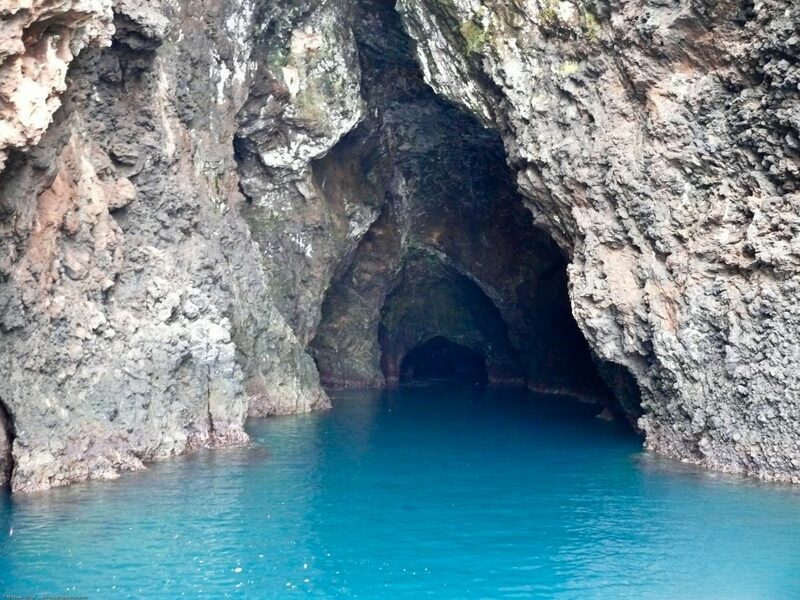 All other caves are only accessible by boat or kayak. Several kayaking tours are available, but if you plan to head out on your own, be sure to wear a lifejacket and helmet. Rent a kayak (or bring your own) and launch from Avenida de la Playa. If the conditions are safe, you can paddle inside the caves and admire millions of years’ worth of erosion and natural beauty. It’s even possible to swim into the caves if the current isn’t too strong. Drift through schools of harmless leopard sharks or snorkel along the rocky bluffs searching for lobsters. Camp at the Santa Fe Park RV Resort, which offers full hookups and is less than 15 minutes away from the caves. Orcas Island is the largest of the San Juan Islands, located in the Puget Sound between Washington and British Columbia. The island sports a small town with restaurants and kayak rental companies, so you don’t have to rent from the mainland. Take a tour around the island or go solo. Paddle out to the more secluded Sucia Island and catch a glimpse of a bald eagle or a pod of porpoises. Whale sightings are common as well. 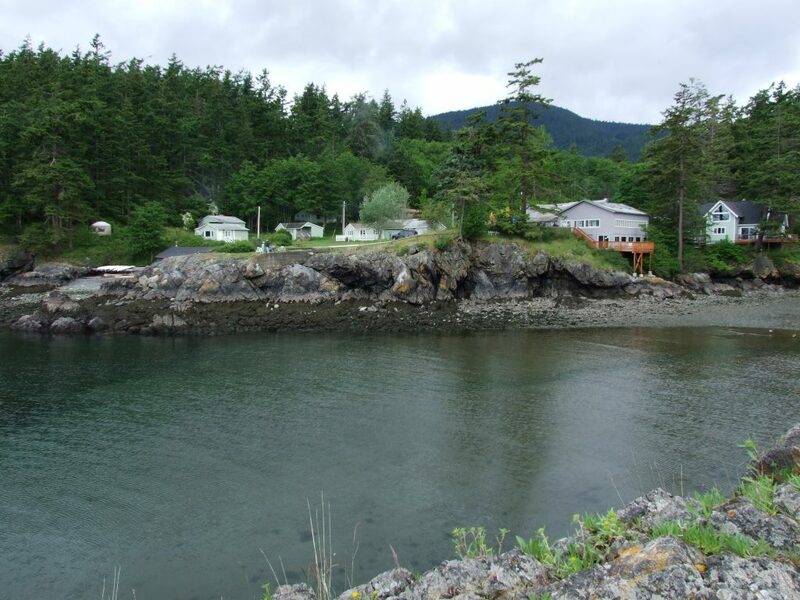 Two RV parks are located on Orcas Island—West Beach Resort and Moran State Park. Take an RV-friendly ferry from Anacortes to either of the two campgrounds, where you can access several launch points in a matter of minutes. You can also drive up Mount Constitution in Moran State Park to find an old stone tower with amazing views and a vintage Airstream that sells ice cream. 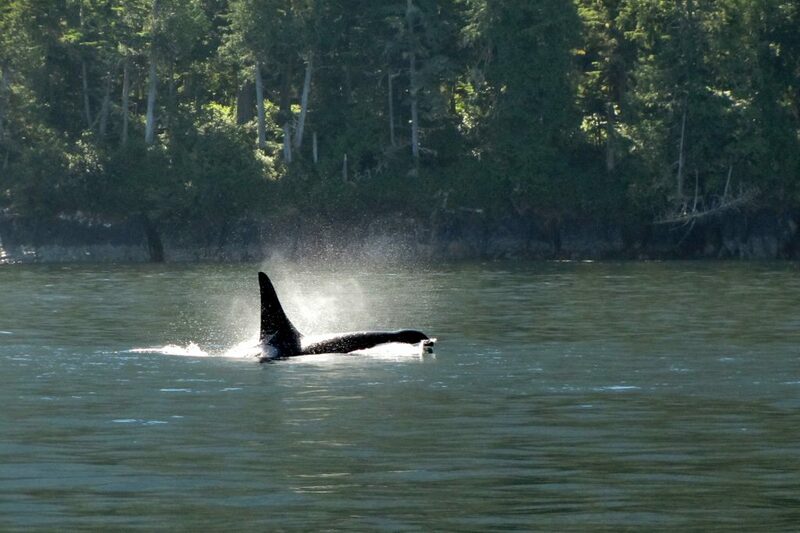 Located off the Eastern Coast of Vancouver Island, Johnstone Strait is home to the largest pod of orcas in the world. Beginning in late June, the water is filled with over 200 killer whales who come to give birth and raise their young. The village of Telegraph Cove offers ideal access points to the Robson Bight Ecological Reserve, where these orca sightings are far from rare. The town also features two museums—the Whale Interpretive Centre and the North Island Discovery Centre. Homes and restaurants comprise the rest of the village, all built on stilts over the water. Camp at Alder Bay Resort, which is a little over 15 minutes away from Telegraph Cove, or Cedar Park Resort, which is about 30 minutes away. From the cove, you can take a tour or rent a kayak. Paddle out into the middle of the water to get up close and personal with an 8,000-pound orca. Located off the coast of Southern California, the Channel Islands are an archipelago stretching from the coast of Santa Barbara to Huntington Beach. From the Painted Sea Cave on Santa Cruz Island to the lighthouse on Anacapa Island, to the largest seal and sea lion rookery in the nation on San Miguel Island, the “Galapagos of North America” are teeming with wildlife and natural wonders. Rentals and tours of the islands are available from the mainland. Catch a glimpse of the rare island fox or island scrub-jay, found only on the Channel Islands. Snorkel in the lush kelp beds of the Pacific. Visit the Santa Rosa Island mammoth skeleton in the Santa Barbara Museum of Natural History. Explore the beauty and diversity of Coastal California condensed into a few incredible islands. Although it’s possible to kayak to the Channel Islands from the mainland, the journey is very rigorous and should only be attempted by very experienced kayakers. Instead, consider taking a 1-hour boat ride from Oxnard to Santa Cruz Island. If you book a tour, transportation for kayaks is usually arranged. However, if you rent or bring a kayak, be prepared to arrange your own through a local business. The two closest RV parks are McGrath State Beach and Ventura Beach RV Resort, both of which are located in Oxnard, California. 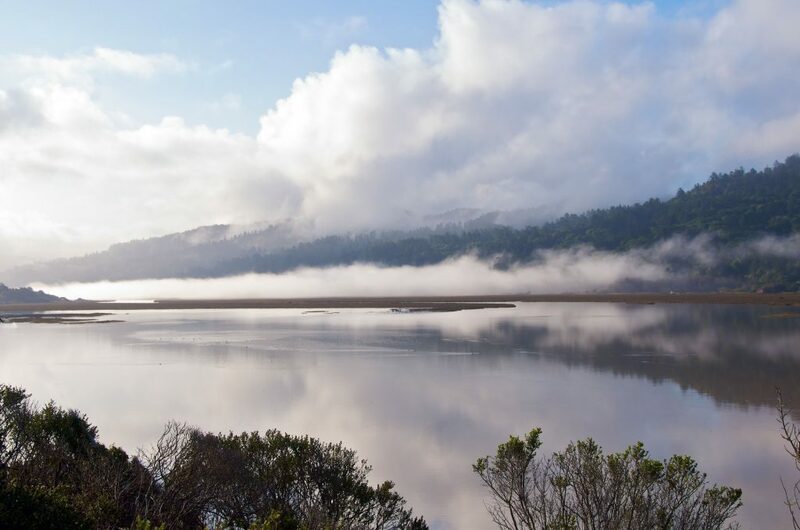 Located north of San Francisco, close to Point Reyes National Seashore, Tomales Bay is a long, narrow inlet ideal for viewing wildlife. Paddle along the scenic shoreline and look for Tule Elk, bat rays, and leopard sharks. An array of wildlife appears on the shore during the day. However, one of the bay’s most impressive phenomena is only visible after dark. When the sun sets, bioluminescent plankton known as dinoflagellates emit a soft green glow, causing the water to light up like the Aurora Borealis. Every time a paddle hits the water or a fish surfaces, the light flares. Night tours are available for witnessing this incredible feature, but be sure to make a reservation 4-6 weeks in advance. Lawson’s Landing and Olema Campground are both relatively close to all four launch areas and kayak rental companies in Tomales Bay. Take a tour of the bay, explore the local tide pools, or paddle into nearby esteros for calmer waters. However, if you venture toward the mouth of the bay, be very cautious. High winds, strong currents, and the occasional shark can make this area challenging to navigate. Magdalena Bay, a stretch of deep water located near the southern tip of Baja California, is known for its spectacular whale watching. The mingling of the Alaskan cold current and warm currents from the equator create a distinct environment for marine life, as well as a prime fishing location. 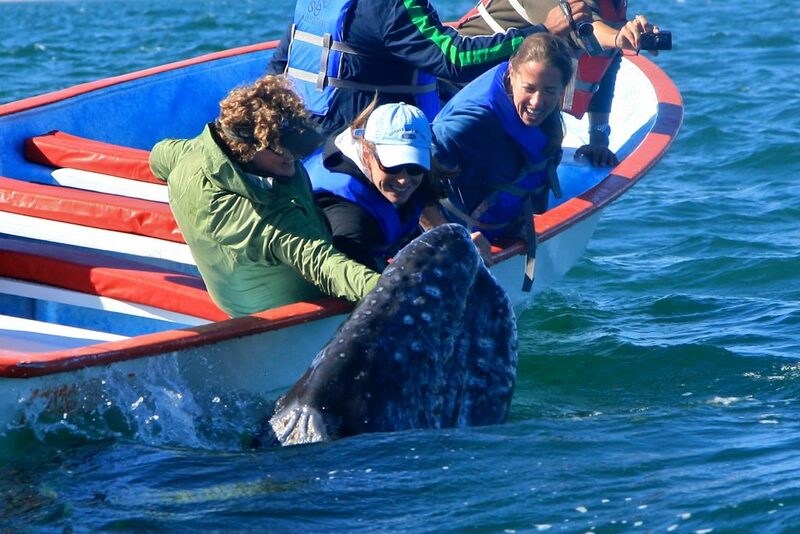 Gray whales, which give birth to calves throughout the warm waters of Mexico, are plentiful and friendly. In fact, it’s not uncommon for them to swim up to boats and allow people to pet them on the head. Black Sea Turtles and several species of migratory shorebirds are also unique to the area. Whale-watching tours, kayaking tours, and kayak rentals are available at several launch points around the bay. The closest RV parks are Palapa 206 RV Park and Misiones RV Park. Drive about 45 minutes to the bay and prepare to come face-to-face with the gray giants of the Pacific Ocean. Morro Bay, a quiet sanctuary for sea mammals and migratory birds, is located on California’s Central Coast. Otters lounge in floating masses of kelp, invertebrates hide in the eelgrass beds, and herons nest in a nearby rookery. The bay’s crowning glory is Morro Rock, a 581-foot volcanic plug. The large geological formation serves as a nesting ground for endangered peregrine falcons. Two creeks feed into Morro Bay, forming an estuary where waterfowl gather in flocks. These calm waters are ideal for beginning kayakers. Camp at nearby Cypress Morro Bay RV and MHP or Morro Dunes RV Park, and launch from the Kayak Shack. 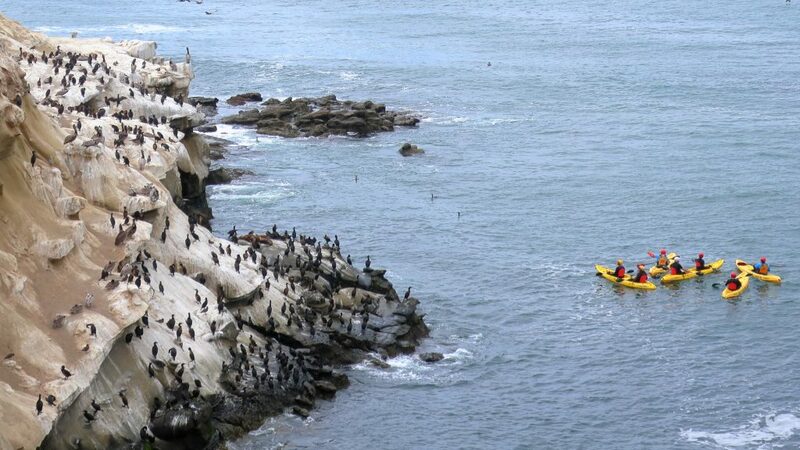 During high tide, you can also launch from the Cuesta Inlet in Los Osos and paddle through the estero. During low tide, stick to the front of the bay to avoid becoming stranded on one of the massive sandbars. Explore the dunes or sign up for a sunset tour. Visit the Morro Bay Natural History Museum. 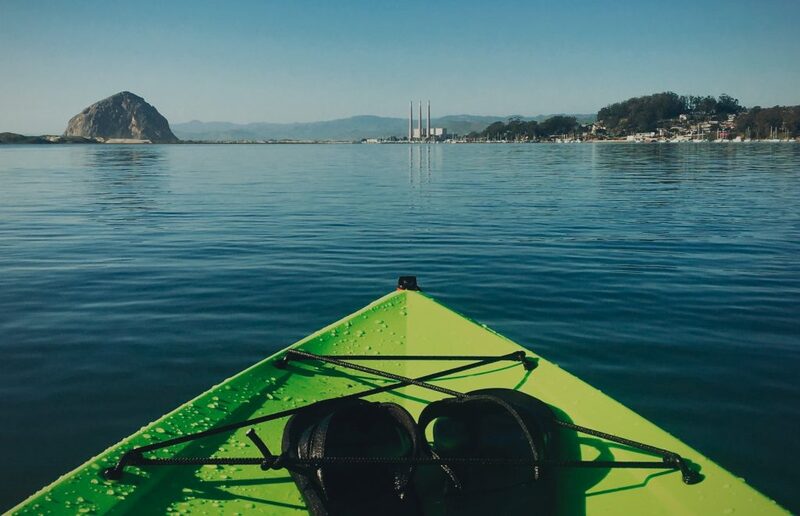 Go kayaking at any time of day and enjoy the idyllic waters of Morro Bay. 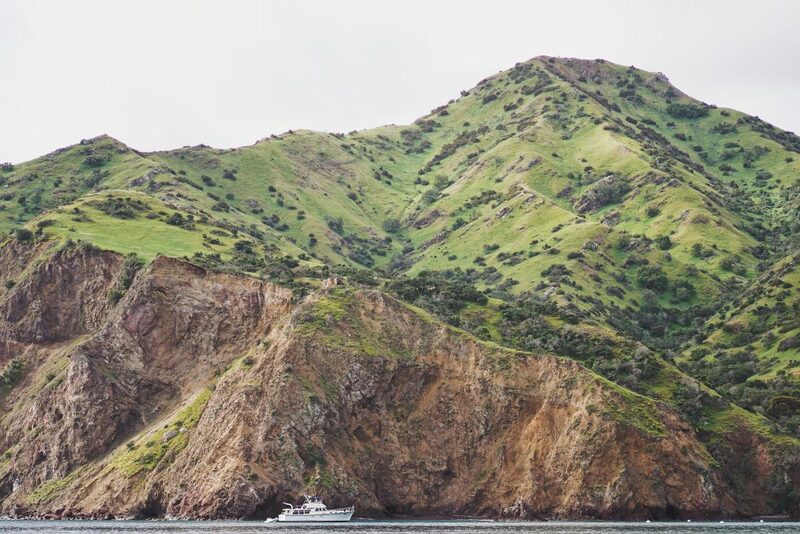 Although it is technically one of the southern Channel Islands, Santa Catalina Island deserves its own category. Not only is it the only island inhabited by people, but it is also more accessible for water activities. Surrounded by crystal clear water, Catalina is popular among divers and snorkelers. Glass-bottomed boats tour the shallows in search of fish, and pelicans dive into the waves. Paddle along the rocky shoreline into coves and onto secluded beaches. Two towns are present on the Island—Avalon and Two Harbors. Both are small but popular among tourists. Although there are a few campsites on the island, none of them accommodate RVs. Camp on the mainland at Newport Dunes Waterfront RV Resort or Sunset Vista RV Park, then take a 1-hour ferry ride to the island. You can rent a kayak at any of the businesses in Avalon or Two Harbors. You can also rent kayaks on the mainland, but if you plan on kayaking the 24 miles from the shore to Catalina, be prepared for a 9-hour trip each way. One of the most remote (but also most breathtaking) locations for sea kayaking is Glacier Bay. 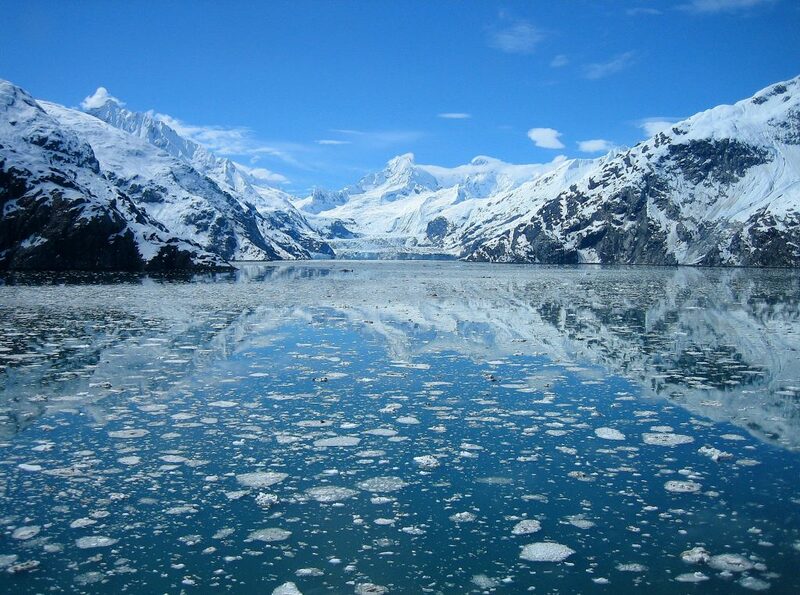 An Alaskan inlet and national park, it features scenic views of the glassy water and the John Hopkins Glacier. Glide through icebergs and past shorelines where bears roam and bald eagles nest. Watch flocks of puffins hunting for fish in the icy depths as schools of salmon swim beneath you. The bay also features regular humpback whale sightings, so keep on the lookout. There are no RV parks in Glacier Bay National Park, only walk-in campsites. However, you can park your RV at Spruce Meadow RV Park or Mendenhall Campground on the other side of the water, then take the ferry from Juneau to the bay. Book a tour or rent a kayak and launch from Barlett Cove. The waters are calm, allowing for a leisurely kayaking pace and time to admire the view. Although Glacier Bay may not be the most convenient excursion, it can be the trip of a lifetime. What it lacks in accessibility, it makes up for in solitude and idyllic scenery. 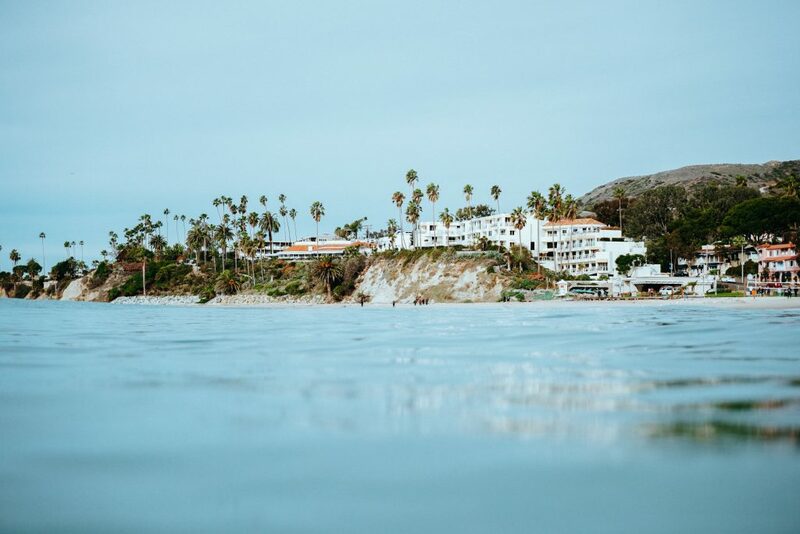 Recognized as one of the most beautiful seaside destinations, Laguna Beach is a coastal city known for its secluded shores. The stretch of nearby ocean is ideal for sea kayaking. From the sea lions on seal rock to the sea cave at Thousand Steps Beach, the area is well worth exploring. Laguna Beach’s mild weather makes it the perfect destination for beginners. Paddle to the gorgeous Emerald Bay and be on the lookout for dolphins. Don’t miss a visit to Pirate Tower, the hidden gem of Victoria Beach. Once the property of a naval captain who entertained local children with his swashbuckling stories, the cliffside fortress is now kept locked up. If you look closely at the base, however, you may be able to find remaining coins hidden between the stones. The most accessible launch point for kayaking is the main beach, but it’s possible to launch from just about anywhere. Camp at Crystal Cove State Park, a popular destination for divers and snorkelers, and make your way along the scenic shoreline. Rentals and tours are also available from various companies. Remember to file a float plan. Check the water temp and dress accordingly. Be aware of tipping over and know how to do a cold water rescue if needed. Otherwise a tour.might be what u need.